The Members Debate system in the Scottish Parliament affords backbench MSPs an opportunity to highlight and lead discussion on topics of constituency and wider interests. During the Parliamentary year now drawing to an end, I have led three such debates, covering issues ranging from marking Earth Hour through, most recently, to calls for a ban on selling Energy Drinks to Under 16s, with celebrating the Scottish Stone industry(which Angus is at the heart of) in between. The Energy Drinks issue is one I have been interested in for a couple of years now after hearing from secondary school teachers of the disruptive classroom behaviour they were encountering following the consumption by pupils of these high in caffeine drinks. To be clear, and to their credit, Angus Council had long banned the sale of these beverages on school campuses. The problem lay in pupils heading elsewhere during lunch break and consuming them, sometimes in significant quantities. This of course isn’t a issue confined just to Angus or indeed Scotland. Countries across Europe have been taking steps for a number of years to try and address it. And in the UK an outright ban is being called for by some, including celebrity chef Jamie Oliver. But experience from elsewhere makes clear that imposing such a ban is not without significant challenge. 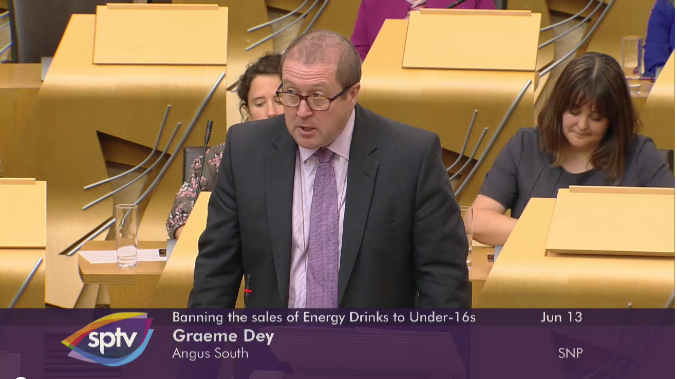 So it has been heartening, as my debate highlighted, to see many well known retailers step forward and voluntarily cease the sale of these drinks to Under 16s. These have included all the major supermarket chains and members of the National Federation of Retail Newsagents. Supermarkets, collectively, tend very often to attract criticism. I was happy during the debate to redress the balance and recognise this example, on their part, of responsible retailing. But we do need other businesses to follow their example and desist from selling these drinks to youngsters. Because they aren’t just the cause of disruptive classroom behaviour. They are also, given the high levels of caffeine they contain, bad from a health perspective.